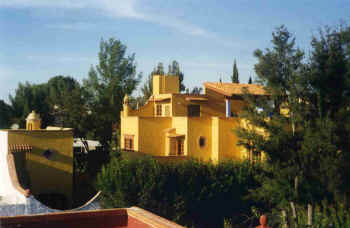 Located in the Colonia of Atascadero, above the 16th century Spanish colonial town of San Miguel de Allende, this sunflower-yellow house is just a 20-minute stroll down cobblestone streets to "El Jardin," the central plaza and heart of San Miguel. 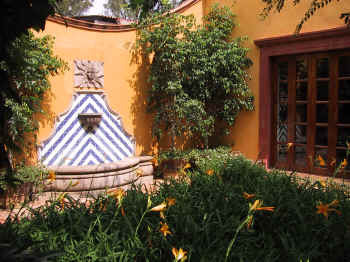 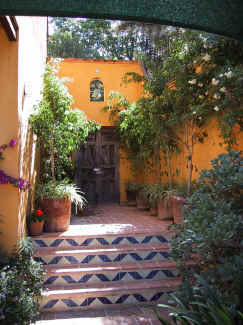 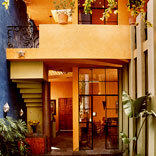 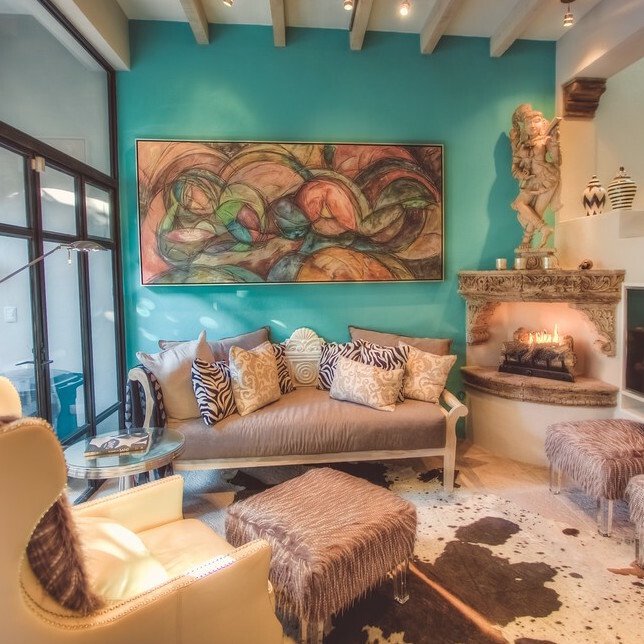 Built in the modern Mexican style of Barragan with clean, dramatic angles, balconies off each bedroom overlooking the central courtyard and a garden complete with tiled fountain and checkered blue-and-white pool, the property is enclosed with surrounding walls in the traditional manner. 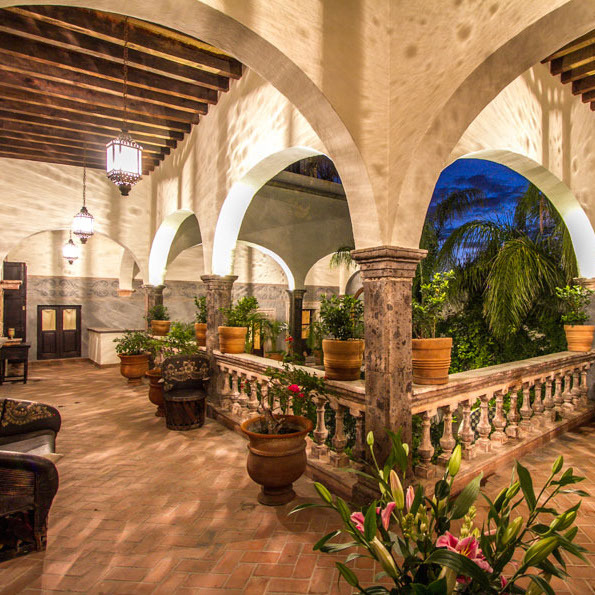 The interior is inviting with typical terracotta and earth tones highlighted by blue and mauve, richly tiled bathrooms and Mexican paver tiles throughout. 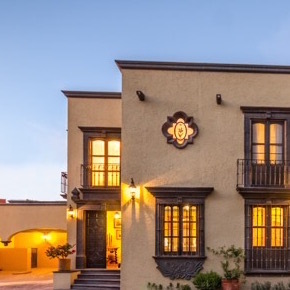 The extensive view over San Miguel from the rooftop terrace, the many church steeples, the high desert valley and the mountains beyond is magical at sunset while sipping margaritas and listening to far-off mariachi bands in the square below. 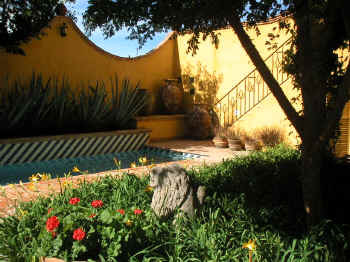 Enjoy the best of outdoor living by the 9-by-16 lap pool, fountain, tiled picnic table and metal chairs, outside covered living room with traditional equipale cushioned leather sofa and chairs, and a vibrant floral garden. 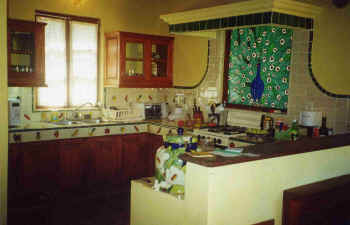 There's also a fully equipped kitchen with breakfast alcove, beautiful stained glass window, laundry area, dining room and sunken living room with built-in upholstered benches and corner fireplace. 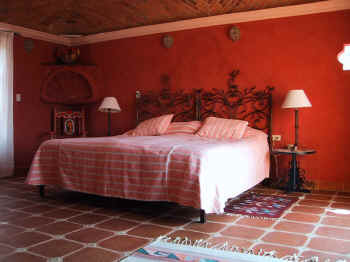 The master bedroom has a king bed and duvet, high ceilings with wrought-iron chandelier, French doors to a private terrace, and a spacious tiled bathroom with view, bath and shower. 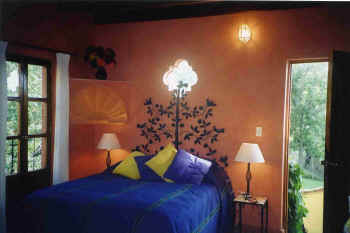 The guest room can be made up either as a king or with twin beds. 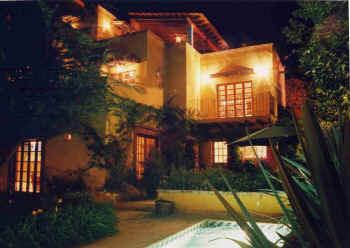 Its charming boveda (domed) ceiling and cupola make a special retreat, with French doors to a private balcony with mountain view, plus its own en-suite tiled bathroom with shower. 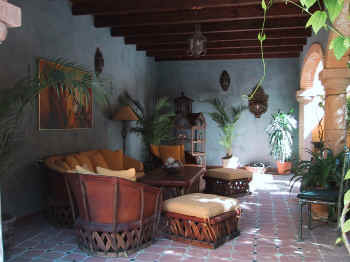 Upstairs from the master bedroom is a loft as well as a large terrace, partially covered, with tiled picnic table and chairs. 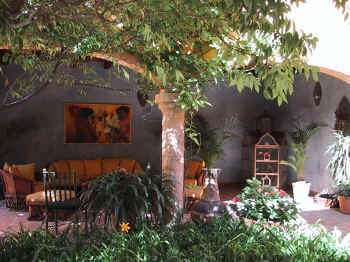 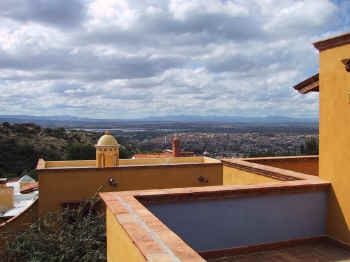 This special spot offers a spectacular valley view over San Miguel and the countryside beyond. 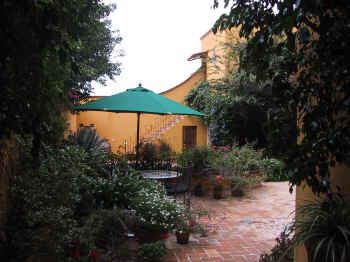 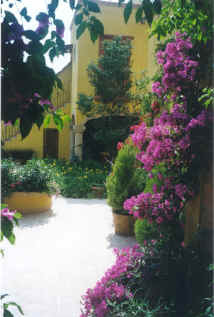 A second guest room is in the casita over the outside sala, complete with its own cupola ceiling, queen bed and duvet, courtyard garden view, and tiled bathroom with shower. 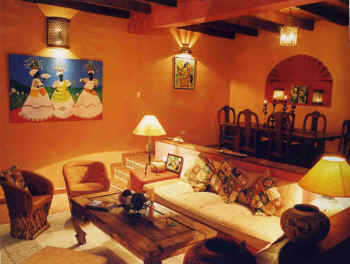 A perfect getaway for two couples at the weekly rate of $1350 USD or $4000 USD by the month. 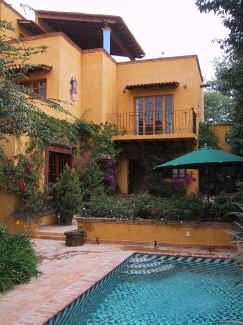 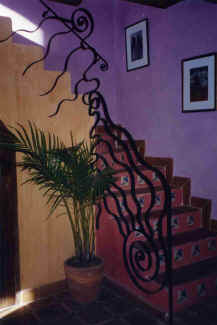 For a third couple, or a total of six people, the rates are $1500 USD/week and $4600 USD/month. 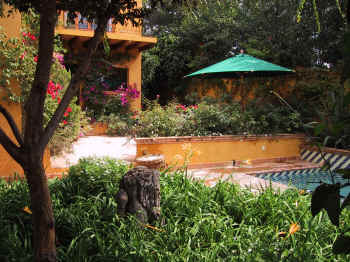 Adults preferred, but well-behaved children age 10 and older are welcomed with parental supervision, especially in the pool.